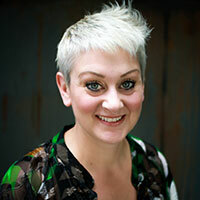 Lori began her career over 20 years ago and has been a stylist at Dop Dop for over 13. As an International Platform Artist for Redken, she is recognized as a leader in hairdressing. She has traveled the world captivating clients and salon professionals with her creativity and passion. She has also contributed to the shows at New York Fashion Week and her work as been featured in various fashion and beauty publications. Lori excels at emphasizing a client’s personality through creating a total look with new shapes, colors, and textures – constantly pushing the boundaries of her craft.